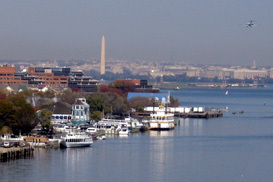 Located on the Western bank of the Potomac River, Alexandria is just over 5 miles from downtown Washington, DC. The Historic center of Alexandria is known as “Old Town”. With its shops, museums, restaurants and theaters, as well as its location on the Potomac, Old Town is a major draw for tourists. The City of Alexandria became its own entity in 1870. The surrounding county was renamed in 1920 from Alexandria County to Arlington County in order to avoid confusion with the city, however there is a portion of Fairfax County that is referred to as Alexandria that is separate from the city. Many of the Alexandria neighborhoods are older, compact and walkable. Alexandria is the seventh largest and highest income city in Virginia. In 1999 the city celebrated its 250th Anniversary. The land that is now Alexandria was originally owned by Captain Philip Alexander II who moved there in 1746. In 1748 there was a petition to create a town at Hunting Creek on the Potomac which was part of Captain Alexander’s property and to which he was opposed. In exchange, the petitioners offered to call the new town Alexandria in honor of the Alexander family and so Philip and his cousin, Captain John Alexander gave the land and are now listed as the town’s founders. In 1791, Alexandria was part of the area selected by George Washington to become the District of Columbia and was ceded to the U.S. Government, however in 1846 it was retroceded back to Virginia and was re-chartered in 1852. During the War of 1812, a British fleet launched the Raid on Alexandria in which Alexandria surrendered and their stores and warehouses of flour, tobacco, cotton, wine and sugar were looted by the British. Later, Alexandria was a main port in the slave trade. During the Civil War, Alexandria was mainly under Union control and remained under military occupation until the end of the war. Many historic buildings and sites were used as hospitals and barracks during this time. There are many sites that are on the National Register of Historic Places and many great political figures can be associated with locations in Alexandria. Old Town – This area is known for its historic townhouses, antique shops, boutiques and restaurants was originally laid out in 1749 in a grid plan of square blocks. Many of the older homes here are monitored by the historical society and subject to strict guidelines of materials and appearance. Rosemont – Named after a neighborhood with same name in Philadelphia, PA, Rosemont is the oldest planned residential expansion in Alexandria developed between 1900 and 1920. Situated to the west of Old Town, much of the area is included in the historic district of Alexandria. The Berg – Built in 1945, this community, situated at the northern limits of Old Town, is a 260-unit public housing complex. Seminary Hill – a most residential, single family home community. Lower Alexandria – communities of small homes, row homes, townhomes along with commercial and retail real estate. Landmark – a large single-family area developed in the 1950’s that consists largely of garden style apartments and condo-converted apartment high-rises and a number of townhome developments from the 1970’s. Home to Landmark Mall. Seminary West – situated west of I-395 but still considered Alexandria, this area is a mix of homes ranging from town home communities, and single –family homes to high-rise condominiums and apartments. There are 3 large senior citizen living centers in the area as well. North Ridge – a community developed in the 1930’s through the 1960’s of single family 2-story homes with basements comprised of several neighborhoods.